Apparently this is the month of logo design, this one however I did in collaboration with Henry Faber of DMG. 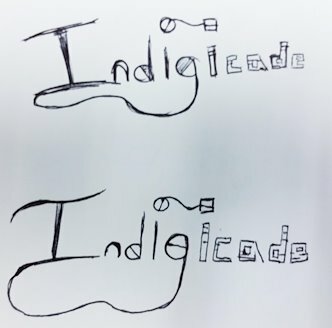 Indigicade is a joint DMG and Indigenous Routes initiative, the same one I was a part of last year where I created Wanisinowin. This year I was approached to create a new logo for the programe. The first is the sketch of my original idea, I wanted to take Woodland Style methods and meld them with a more digital look for the second half. You can see in the next image that’s essentially what I did but as logo design is not something I had studied all I could tell was that it just didn’t look right. That’s where Henry stepped in. In the third version you can already see that with the use of the new font for ‘icade’ the logo becomes more balanced but in creating that balance the connection between ‘Indig’ and ‘icade’ becomes cut off, literally as the line of communication has been disconnected. So I asked Henry to merge our ideas for the first ‘i' in the 'icade’ section. What we ended up with was the third version. Even though it was closer to what I imagined it still didn’t feel right so I moved the connecting line so that it connected with the corner instead of slightly to the side and I gave it a rougher squiggle more in keeping with the first half of the logo. After I realized that the line had been too thin the entire time, so I thickened it a little and I’m pretty happy with the finally result. Now I just need to wait for final approval!